THEROMANCATHOLICWORLD.COM | COURAGE FOR AMERICA! Yes… but most of them are in China. Hong Kong’s Cardinal Joseph Zen Ze-kiun and the Vatican’s betrayal of the Underground Church in China. “China is a huge country and the Chinese people are everywhere” was the statement made by Cardinal Fernando Filoni in his long reflection dated October 22, 2012 titled, Five Years after the Publication of Benedict XVI’s Letter to the Church in China. Filoni was confirmed by Francis in March 2013, as the Prefect of the Congregation for the Evangelization of Peoples. God help us. “… this statement that “Chinese people are everywhere” represents more of the empty rhetoric being spoken by modernist Vatican officials when it comes to China, as they continue to “examine” the “global community”— instead of confronting Communism head on, calling it by its name and denouncing its atrocities. Now Cardinal Joseph Zen Ze-kiun, the retired Bishop of Hong Kong, is trying to gently nudge Francis regarding the plight of the Underground Church in China. But Cardinal Zen Ze-kiun seems to forget the ancient Chinese proverb, “If you walk on snow you cannot hide your footprints,”– which is the reason why I dedicated a section on The Beijing Affair (Part 3) to addressing Cardinal Zen and his ambivalent track-record on the Underground Church in China. It does appear, however, that Cardinal Zen has heeded my specific warnings in The Beijing Affair (Part 3)– where I stated that the Vatican is applying the Ostpolitik approach to China– given his recent remarks: “Unfortunately, on the executive side, people see a lot of compromise. 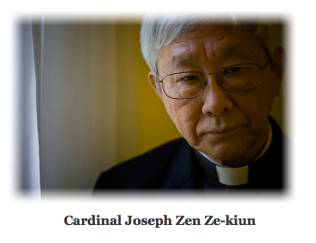 There is the shadow of ‘Ostpolitik.’ “ Sadly, the rest of Cardinal Zen’s remarks leave much to be desired once again– since they show that he continues to toe the modernist Vatican line, by praising the Vatican officials who engage in rapprochement with Communists. Marielena Montesino de Stuart, Marielena Speaks, Marielena Stuart, TheRomanCatholicWorld.com, CourageforAmerica.com, United States and International Readers.